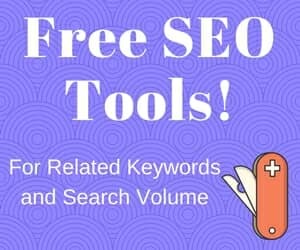 I want to point you to two SEO tools I’ve been using for a long time now, tools that work together to let me do two major SEO tasks very, very quickly: finding related keywords and get keyword volumes/CPC amounts. Even better, they are free. Sometimes a lean tool with fewer features is best, and these tools are a good case in point. When you’re doing keyword research it’s vital to get a wide range of keywords related to the topic you intend to create content around, or the primary keyword you’ll be targeting, if you have it defined. Keyword Shitter (sorry, but that is its name) allows you to put in one or several keywords and then quickly get dozens or even hundreds of related keywords returned to you. These related keywords serve a dual purpose. First, you can discover keywords worth targeting which might be even more attractive than the keyword you’re currently targeting, in terms of relatively high search volumes or low SERP competition. Second, to include as many LSI (latent semantic indexing) keywords is good onpage SEO practice. You’re sure to find many to include in your article or blog post that’s you’d never have otherwise thought of. There are more thorough tools for this but I still find myself using this tool because it’s so fast. The second tool is Keywords Everywhere. First, find and install the browser extension. Then, paste as many keywords as you’d like into it and immediately get the search volume and CPC amounts for each keyword. Choose to get stats from several different countries or ‘global’ for the whole world. See video for the 90 second workflow.